As of 2017, it has been reported that one in ten South African women suffers from endometriosis. Period pain is an ailment seen as one of the banes of being a woman. Most women will experience cramps during their menstrual cycle, and this is usually written off as minor, and treated with over the counter painkillers like ibuprofen and paracetamol. But for some women, the pain experienced during their monthly period can be excruciating and often times debilitating. For many of these women, medical intervention is needed. It is very important to have a medical aid plan, or the best hospital plan you can afford in place, to ensure immediate treatment and diagnoses, and hopefully relief. Endometriosis News explains that monthly hormonal changes cause the lining of the womb (called the endometrial tissue) to thicken in preparation for pregnancy. In the event that the woman is not impregnated, the cells naturally break down and “bleed” out of the body as part of the menstrual cycle. 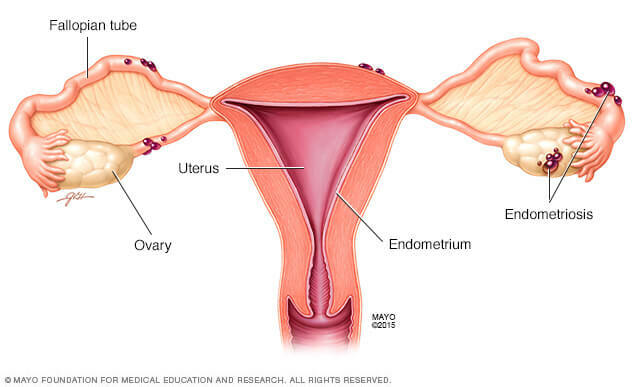 “Endometriosis occurs when these womb cells develop elsewhere in the body. They go through the same monthly cycle, but have no outlet to leave the body once they break down. This causes inflammation (swelling) and potentially the formation of scar tissue in the affected areas”. Researchers are still unclear pf what predisposes women to developing endometriosis, although genetic factors have been pinpointed. Endometriosis tends to run in families, so genetics plays a big part in diagnosis. Pelvic pain and cramping may begin before your period and extend several days into your period. You may also have lower back and abdominal pain. Excessive bleeding. Heavy periods (menorrhagia) or bleeding between periods (menometrorrhagia) is common with Endometriosis sufferers. Fatigue, diarrhea, constipation, bloating or nausea, especially during menstrual periods. Shana Genever, a 29-year old from Cape Town told Affinity Health that she has suffered from Endometriosis for the last 15 years. Shana was diagnosed at the age of 14, after having to stay home from school due to very painful periods. “I was in and out of the doctor’s offices, and they actually thought that I was suffering from kidney problems, because of the constant pain in my back. Luckily, I had a very affordable health care plan, and was able to visit a gynecologist, who did an exploratory surgery on my ovaries, and found the endometrial lesions”. When Shana was 15, she was told that because her endometriosis had already progressed to stage 3, she was more than likely not able to bare children. Many women tell teh same story of excruciating pain, bad enough to have to take time off from work and school. Some are advocating that woemn be allowed to ork from home during their periods, but this is still a fighting cause. “I just can’t take it anymore.” Dani* (23) told Health24. “I was only 15 when my doctor told me I had lesions caused by endometriosis on my bladder, intestines, ovaries and uterus. “I know it sounds ridiculous but I was using about 60 tampons a week – that’s about 240 a month and 2 880 a year. It’s so bad now I’ve been bleeding continuously for the past year. I’ve menstruated for 365 consecutive days. How do I ease menstrual cramps? Heat: A hot water bottle has long been the number one pain relief. Heat helps to relax the contracting muscles in your uterus, which is the cause for your pain. Medical Daily says exercise is also a helpful tool. When you’re doing any type of aerobic exercise, your body is pumping more blood; this helps to release endorphins to counteract the prostaglandins and reduce your cramps. Exercising three to four times a week is good for the overall health of your body, but it is especially important if you’re prone to painful menstrual cramps. A study found that high doses of vitamin D3 led to a significant decrease in menstrual cramps. As reported by Health.com, “40 Italian women were split into two groups: one receiving a single oral dose of 300,000 IUs of vitamin D3 and the other getting a placebo five days before the expected start of their menstrual periods.” Their pain scored dropped by 41 percent, while those in the placebo group saw no change in their pain scale.